South Elevation of the Stone Lighthouse Completed Upon the Edystone in 1759, engraved by Edward Rooker, figures by Samuel Wale, 1763, Bonhams. 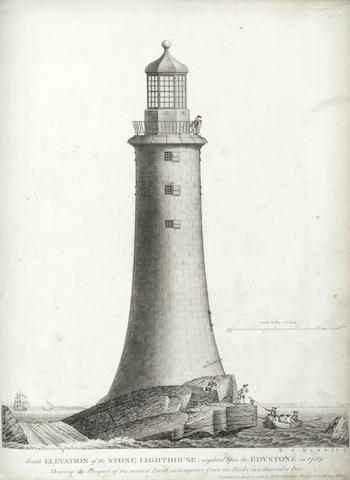 The Eddystone Light is a fixture in the maritime culture of Britain. A true marvel of engineering, this version was completed in 1759. This 1763 print does not appear to be what the auction page is referring to. Bonhams states that this is a book about the Eddystone published in 1791. Even the engraver does not appear to be the same, with Bonhams identifying him as H. Hughes, whose name does not appear on the print. 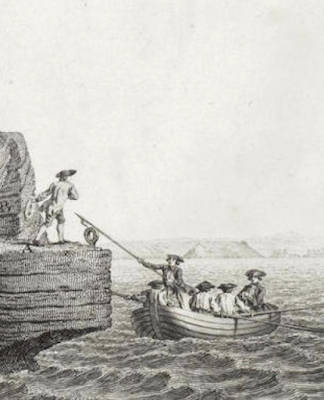 A small crew of sailors carry a gentleman (perhaps a sea captain) to the stone. Each wears a cocked hat and shirtsleeves, with bob wigs or their hair bobbed in a seamanlike fashion. At the bow stands a fellow with a single breasted jacket, extending his boathook to the ring presumably installed for that purpose. He wears plain trousers.